The biggest and most destructive of the windblown fires raking Southern California shut down one of the region's busiest freeways Thursday and threatened Ojai, a scenic mountain town dubbed "Shangri-La" and known for its boutique hotels and New Age spiritual retreats. 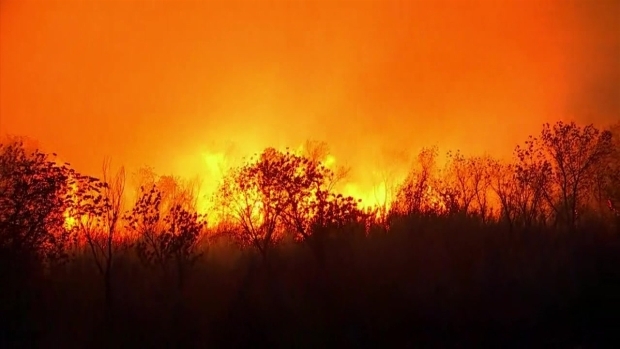 The winds turned out to be less fierce than expected, but firefighters still had to contend with gusts that fanned the fire to 150 square miles and put thousands of homes in jeopardy. As firefighters tried to corral the Ventura fire and at least three other fires in the Los Angeles area, a blaze in rural San Diego County expanded to 4 square miles in just a matter of hours. 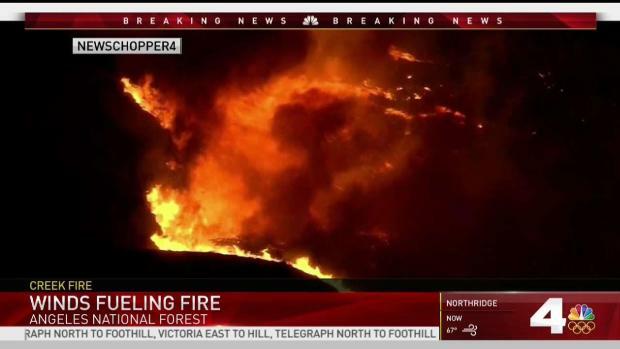 Multiple fires scorched Southern California, forcing thousands of people from their homes. 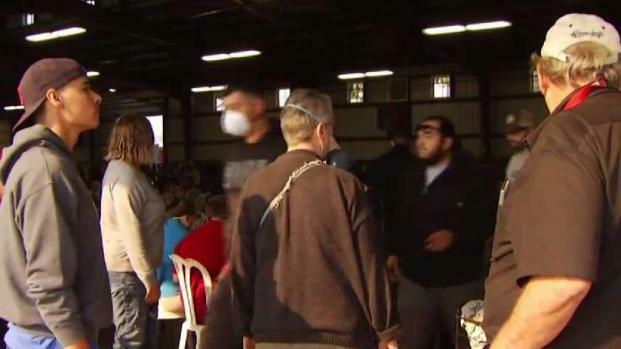 Here are some tips for people looking to help themselves and the thousands of evacuees. Randy Mac reports for the NBC4 News at 5 p.m. on Wednesday, Dec. 6, 2017. The fire tore through the tightly packed Rancho Monserate Country Club community in the small city of Fallbrook, known for its avocado orchards and horse ranches. At least two people were hospitalized with burns. 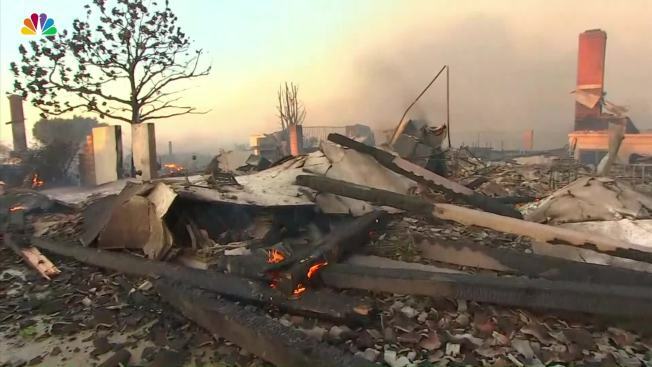 Dozens of trailer homes in a retirement community were destroyed, and multiple race horses at an elite training facility died in the blaze. "We drove through a wall of flames," Wendy Frank said, describing her ordeal after evacuating her horses from Ojai on Wednesday night. "I didn't know if we'd make it. I just put the accelerator down. I know we were going over 100 mph, we could have been going much more, and just hoped for the best." 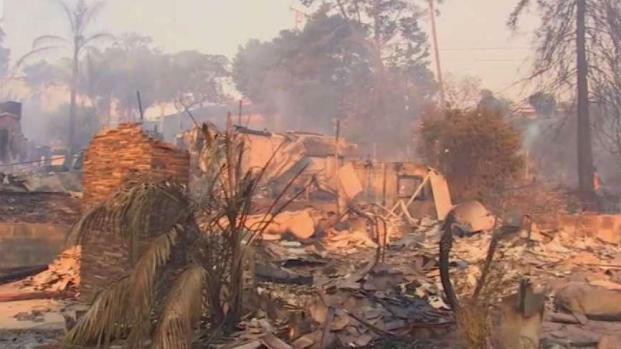 Fires flared up Thursday along the highway, forcing an evacuation of the dozens of homes at Faria Beach. The 101 highway, which runs the length of the state and is a major commuter corridor to Los Angeles, was closed intermittently along the 28-mile stretch between Ventura and Santa Barbara. The Ventura and LA-area fires have put tens of thousands of people under evacuation orders and destroyed more than 400 homes and buildings, a figure officials say is still likely to rise. A vegetation fire broke out in an unincorporated area of Murrieta Thursday afternoon, prompting a response from 140 firefighters. The blaze was reported around 1:14 p.m. PST in the area of Los Alamos and Liberty roads and was burning at "moderate to rapid" speeds, according to the Riverside County Fire Department. 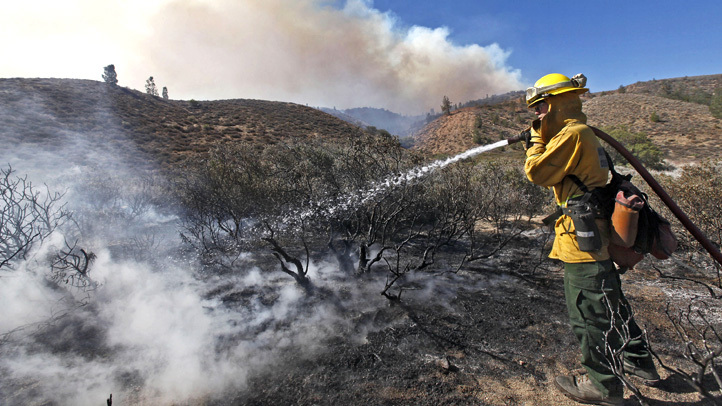 By around 2:30 p.m., the fire had erupted to 100 acres. Firefighters from Huntington Beach and Orange County were battling a brush fire in Huntington Beach on Thursday morning. The size of the fire was not immediately clear, but officials' said firefighters' water drops had the fire "under control" by 10:45 a.m. In Ojai, the normally bustling town was practically vacant as an ominous dark plume hovered high above and flames glowed in the hills. Known as "Shangri-La," both for its role as the stand-in for a Himalayan utopia in the 1937 Frank Capra movie "Lost Horizon" and for the magical vibe it is said to have, the town has attracted artists, hippies and spiritual thinkers for generations. Ojai is a popular getaway some 60 miles northwest of Los Angeles for visitors looking for tranquil hikes, farm-to-table dining and spa treatments that include aromatherapy and a modern-day sweat lodge. Like many of the places that have seen repeated catastrophic fires, such as Malibu or Bel-Air, which continued to smolder from a fire that destroyed four homes Wednesday, it is an alluring place to live but one that is also prone to wildfires. The town is typically sheltered from the strong Santa Ana winds that blow in from the desert, Ripley said. But it is surrounded by dry brush that has not burned in years. Myers reported from Ventura. Associated Press writers Brian Melley, Chris Weber and John Antczak in Los Angeles contributed to this report.